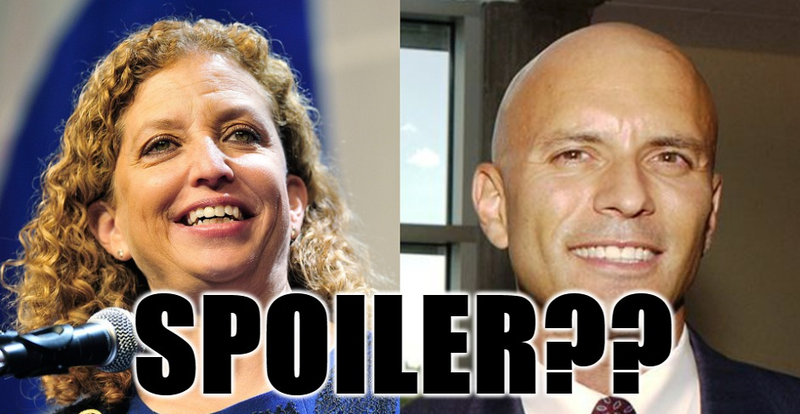 Who’s the Real “Spoiler” in Our Race Against Wasserman Schultz? In early April, I announced I was running as a No Party Affiliation (NPA) candidate — an independent — on the ballot this November against Debbie Wasserman Schultz and a yet-to-be-determined Republican candidate. Almost immediately, the Schultz team started a whispering campaign that I was now a “spoiler” — that by running “third-party” (which I’m not), I would help elect the Republican. They whisper it will be just like when Ralph Nader supposedly helped elect George W. Bush over Al Gore in 2000. This “spoiler” attack is revealing. First, there’s no chance of a Republican winning in a three-way race in this particular district which was specially gerrymandered for Schultz. And second, it shows how worried the Schultz camp is that they can’t possibly win in a three-way race at a time when NPAs almost outnumber Democrats in our district. Florida’s 23rd Congressional District was gerrymandered for Schultz and it’s been a safe Democratic seat — that is, up until now. But the population has been changing here, as reflected in the demographics of registered voters in the district: 25% Republican, 35% indie, and 40% Democrat. In 2000, when Bush beat Gore, there was about a one percentage point difference between Democrats and Republicans. In Florida’s 23rd, Republicans are 15 percentage points behind Democrats and 10 percentage points behind NPAs. It’s hard to imagine a Republican taking second in a three-way race in this district, let alone ever winning. That means Democrats can feel free to vote their conscience, vote for change, and vote against an unpopular incumbent. Among every part of the electorate, including among Democrats, voters agree that the status quo has got to go. Even while running as an indie, we are maintaining strong support among grassroots Democrats. It’s the party leadership we oppose, the ones who have lost touch with the people. We intend to win among grassroots Democratic voters. And that’s because they know I’m the real “New Deal” Democrat in the race and Schultz is now the embodiment of a corporate-owned Democrat. In addition, a great many Democrats, including in Florida, will always see Debbie Wasserman Schultz as the real “spoiler” — spoiling the Democratic Party and our democracy. There’s another big difference between Nader’s 2000 campaign and ours. Nader was running as a Green at a time when only a few percent of the population identified as Green. And while I strongly support the Green agenda and I have the support of many Greens, I’m running as an indie at a time when nearly a plurality of my district now identifies as independent. And here’s the really great news for us: among Millennials, Gen Xers, and younger voters, about 71% are now indie, and they are the most progressive and fastest growing part of the electorate! The Schultz camp should worry that they can’t win a 3-way race! I have one last beef with Schultz’s whispering campaign against me as a Nader-like spoiler. It’s very premise is factually incorrect. In 2000, for every one of the 24,000 Democrats who defected to vote for Ralph Nader in Florida, about 12 times as many Democrats (308,000) voted for Bush. Exit polls in Florida showed that if Nader had not run, Bush would have won the state by even more! After the 2016 election fiasco — with Hillary Clinton losing to Donald Trump after referring to everyone even thinking of voting for him as “deplorables” — Democrats should have learned to stop shaming and blaming the voters. But vote shaming is what this “spoiler” argument is all about and it’s a losing argument. The present political divide is no longer just Republicans versus Democrats. For most of us, it’s insiders versus outsiders, and corruption versus integrity. I’m not afraid of a three-way race, I’m not afraid of debates, and I’m not afraid of Schultz and the corrupt machine she serves. We have the people on our side, and that’s because we are of, by, and for the people. Keep the faith and thank you for all your support! Here’s a rather weak and dismal editorial by the South Florida Sun Sentinel, essentially white-washing the illegal destruction of ballots by Brenda Snipes, the Broward County Supervisor of Elections. Please share with anyone you know living in South Florida! Nothing will change if people are not made aware of what’s actually happening. And it’s painfully clear that the Sun Sentinel and others in the corporate media will keep hiding the truth if permitted to do so. The Sun Sentinel lamely points out that Snipes has not been charged with any crime — at least not yet — to try to justify her remaining in office, making $177,628 a year, until 2020. Instead, they should be asking whether federal or state prosecutors are investigating Snipes’ crimes. They may also ask what it says about our criminal justice system if prosecutors are also sweeping this under the rug. The answer is obvious: that if you’re wealthy, powerful or politically connected, you are above the law. The Sun Sentinel fails to mention the hundreds of thousands of taxpayer dollars still being wasted by the Supervisor still litigating so many months after admitting to destroying all the original ballots cast in our 2016 primary against master-rigger Debbie Wasserman Schultz. The Sun Sentinel has once again forgotten basic journalistic ethics by asking Snipes’ lawyer to comment on the case without bothering to ask our very capable lawyers for comment. Instead, the Sun Sentinel repeated, without rebuttal, the Supervisor’s claim that I somehow delayed my public records request – the exact opposite of what actually happened. It was the Supervisor and her attorney who delayed and delayed for seven months until I finally sued. And we have ample proof, a record of correspondence between our lawyers to prove it! The Sun Sentinel also repeats Snipes’ lame defense that I kept changing my public records request and the request was unreasonable because I offered to bring our own rented scanning and photocopy machines. They didn’t mention that this was in response to Snipes informing us that she had not made any digital scanned images of the ballots. Nor did the Sun Sentinel report that the Supervisor later changed her story — in other words lied — about whether or not she took digital images, which mysteriously and suspiciously turned up only after Snipes destroyed the ballots. This is all well documented in our videotaped depositions of Snipes and her senior staff, and in the documentary evidence obtained in the pre-trial discovery process. It’s telling that none of Snipes’ spurious defenses carried the day with the Florida Circuit Court. There’s absolutely no reason to indulge in “even the best reading of Snipes,” as the Sun Sentinel does. Given her pattern of deception and illegal conduct, Snipes deserves no such presumptions. Unfortunately, we must consider the worst of readings, that Snipes destroyed the ballots to cover up an electronic hacking or software manipulation that altered the outcome of our primary against Debbie Wasserman Schultz. Why else commit felonies in destroying the ballots and then lying about the destruction for months?! Instead, the Sun Sentinel editors play the part of Captain Renault in the classic film Casablanca, “Shocked, shocked!” that gambling was going on in the casino. The Sun Sentinel also repeated Snipes’ lawyer’s characterization of my lawsuit as a “political stunt.” How utterly sad and pathetic. I’ve paid thousands of dollars out of my own pocket, have sacrificed so much in time, energy and resources, and only to discover that our elections are not transparent or verifiable. Yes, some stunt. Exercising my rights under the Florida constitution and statutes, only to be screwed when the ballots were destroyed. For my next stunt, I will go broke only to get the Supervisor to wrongly exclude my name from the November ballot. I grew up in a time when public officials would be prosecuted and go to jail for what Snipes did in destroying all the paper ballots in our elections. Prosecutors would prosecute and the news media would report. There would have been a public outcry by public officials of both parties. So far, it has been largely swept under the rug and by both parties and the press. The Sun Sentinel further tries to justify its support of Snipes staying in office through 2020 by . . . politics. They don’t trust Republican Governor Rick Scott to replace her with a non-partisan Democrat, as they say former Governor Jeb Bush did when he replaced Miriam Oliphant, a previous Broward Elections Supervisor, with Snipes. The Sun Sentinel is incorrect, Snipes was a Republican who quickly changed her party to Democrat to adapt to blue Broward County. And then the Sun Sentinel concludes that Oliphant’s failures were worse than Snipes’, yet without ever bothering to make the case by discussing Oliphant’s failures. And it’s a ridiculous argument anyway, a bit like comparing a jewel thief with a bank robber, when neither should be acceptable. I am also not thrilled with the prospect of a Republican Governor naming a replacement for Snipes. But that’s not a good enough reason to keep someone with Snipes’ record in office for even one more election. And that’s why the Sun Sentinel has to give Snipes the benefit of the doubt and assume she just made a mistake. She deserves no such presumptions. Not only did Snipes illegally destroy the ballots and sign a destruction order certifying the ballots were not the subject of pending litigation when they were, she also destroyed evidence and concealed all of that for two full months, lying to me and my lawyer as we prepared for a ballot inspection that could never happen, and lying to the court. The Sun Sentinel did not discuss any of this, and it’s because they don’t like or trust Rick Scott. Well, that’s no reason to trust Brenda Snipes or the integrity of any election she has ever supervised. The Sun Sentinel editorial is entitled “Brenda Snipes’ Credibility Past Tipping Point.” If that’s the case — and it is — then no candidate who’s on the ballot in the August primary or November general election should have any confidence in her supervising their elections. If her credibility is past the tipping point, state and federal prosecutors should be investigating. Only a newspaper chain that doesn’t face voters or rely on fair elections could be so sanguine about keeping an elections supervisor in office for two more years of elections even though her criminal actions suggeat outright corruption. The Sun Sentinel should know that our democracy also suffers when we lose faith and confidence in the integrity of the press to be neutral, non-partisan, impartial, unbiased. and free. Thank you for spreading the word..
Broward County needs a new supervisor of elections, but not the way Tim Canova wants it to happen. Last month, Canova prevailed in his lawsuit alleging that Supervisor Brenda Snipes wrongly destroyed paper ballots from his unsuccessful challenge of U.S. Rep. Debbie Wasserman Schultz in the 2016 Democratic primary. In a recent op-ed for the South Florida Sun Sentinel, Canova called for Gov. Rick Scott to suspend Snipes and appoint a replacement. Governors can remove constitutionally elected officers like Snipes only for misfeasance or malfeasance. Snipes faces no criminal charges, but her actions in the Canova case again question her competence. Snipes’ recent problems include results being too early and too late, and several mistakes with ballots in 2016. Snipes ordered the Canova-Wasserman Schultz ballots destroyed 12 months after the election, even though federal and state laws require preservation for 22 months. Snipes did so even though a lawsuit over the ballots was pending. She called it a mistake. We must note that Snipes got the job through a gubernatorial appointment. In 2003, then-Gov. Jeb Bush removed Miriam Oliphant because there was doubt that she could hold an election on her own. There was some controversy because Bush is a Republican and Oliphant is a Democrat, but Bush’s decision was correct. And in heavily Democratic Broward County, Bush picked Snipes, a Democrat and former high school principal. Despite Snipes’ problems, she has not dropped to Oliphant’s level of incompetence. Scott’s record also gives no assurance that he would avoid partisanship in picking a replacement. Scott, a Republican, signed an elections bill that a judge determined was designed to suppress votes by those who tended to vote Democratic. Scott approved a partisan-designed purge of voter rolls that supervisors of both parties resisted. In addition, Republican groups twice have made bogus claims against Snipes in what we believe were efforts to drive down Democratic turnout. One came from the National Republican Lawyers Association. Another, in the form of a federal lawsuit, came from the American Civil Rights Union, a conservative counterpoint to the left-leaning American Civil Liberties Union. Snipes prevailed in that litigation. We defended her in both instances. Still, Florida’s second-largest county deserves better. Even the best reading of Snipes in the Canova case is bad for her. It would seem simple enough to follow basic rules on how long to preserve ballots. Yet Snipes didn’t. She blamed her staff for mislabeling boxes and giving her bad information. But Snipes is the supervisor. And this is not the first time we’ve had reason to question her supervisory skills. We sought comment from Snipes’ attorney, Burnadette Norris-Weeks. She cited the supervisor’s motion for summary judgment. In that filing, Snipes claims that Canova placed “unreasonable conditions” on his request for the ballots. He wanted to bring his own equipment. He made demands that were outside the request. The office did not hear from Canova or his representatives for months before he filed the lawsuit. In essence, Snipes claims the request by the Nova Southeastern University law professor was a publicity stunt. Canova lost to Wasserman Schultz by 14 points, well outside the margin for a recount. The ballot inspection would have been his version of a recount. Canova has suggested, directly and indirectly, that the primary was rigged against him. So Snipes deserved to lose. Public trust, however, becomes collateral damage. Snipes even claimed that scans of the original ballots were an “alternative form of preservation.” That sounds too much like “alternative facts” and is not what a supervisor of elections should say. Snipes hurt her case further by demanding that Singhal recuse himself. The supervisor claimed that Singhal ruled against her — a prominent Democrat — to improve his chances of an appointment to the federal bench. Yet Snipes got 76 percent of the vote and easily won a fourth term. Absent a strong candidate with widespread backing from the Democratic Party, Snipes likely would win again in 2020. But the Canova case shows again that Snipes has stayed too long. Because of her failure to retain the ballots as required, Scott is sending state employees to monitor her work in this year’s elections. “The Secretary of State’s office will continue to ensure that every Supervisor of Elections understands and follows the law,” his statement said. Brenda Snipes should announce that she will not seek another term. Judge sides with progressive challenger Tim Canova and journalist seeking public records. The Florida county election supervisor overseeing one of 2016’s most bitter primary races, pitting the just-resigned Democratic National Committee Chairwoman Debbie Wasserman Schultz against progressive law professor Tim Canova, unlawfully broke federal and state laws by prematurely destroying that election’s ballots. A ruling by Broward County Circuit Court Judge Raag Singhal found Broward County Election Supervisor Brenda Snipes violated the state’s open record laws and federal law when she destroyed the ballots a year after the August 2016 primary, where Wasserman Schultz beat Tim Canova by 6,775 votes, according to the certified results. (Federal law requires election records be saved for 22 months after the general election). Canova, assisted by television journalist and documentary filmmaker Lulu Friesdat, wanted to verify the 2016 primary’s vote count. But Snipes repeatedly rebuffed their efforts, even telling Friesdat thst she would have to pay nearly $72,000 before the election office in Florida’s second most populous county would produce the primary’s ballots. Singhal went further and chastised Snipes for stonewalling a candidate and the media. Singhal ordered Broward County to repay Canova’s court fees. The County election office and its attorneys have not been commenting to the press. But Politico reportedthat Republican Gov. Rick Scott’s administration has said it would send an observer for the upcoming 2018 primary in August and general election in November. Canova, who is again challenging Wasserman Schultz in 2018—as an Independent—said Scott should remove Snipes and federal officials should open an investigation. Canova said his attorneys have told him that Broward County is likely to appeal the decision. “So far, our legal fees are $250,000,” he said, adding the prospective appeal could end up costing the county’s taxpayers $1 million, after lawyers on both sides are paid. What Was Broward County Hiding? In 2016’s primary, Wasserman Schultz reportedly received 28,298 votes, compared to 21,504 votes for Canova. That primary came weeks after she resigned as DNC chairwoman because her staff had been caught plotting against Bernie Sanders’ campaign for the Democratic nomination. Emails from her staff had been hacked by Russian agents, according to U.S. intelligence officials, and ended up on Wikileaks. That backdrop, pitting Canova, a Berniecrat progressive, against one of Hillary Clinton’s most ardent supporters and a centrist, attracted national attention. However, Canova lost the primary by 13 points and initially did not seek a recount. After he was contacted by Friesdat, whose team had done a statistical analysis of the race, he began to question the count’s accuracy, he said this week. Canova’s campaign had also done internal polling that made him believe the actual primary results were much closer than the officially certified vote total, prompting the ensuing open records request, subsequent court filings in response to the county’s stonewallling, and the Florida Circuit Court ruling in his favor—because Broward County had destroyed the 2016 ballots. While Canova and election transparency activists hailed the ruling, Canova said there was tremendous pressure from election officials and Democratic Party to drop the matter and not verify the vote. Until Singhal’s ruling, he was treated as an unwelcome gadfly citing federal law that said election records had to be saved for 22 months and Florida law saying they had to be made available for inspection and copying. After the results of Tim Canova’s August 2016 primary against Rep. Debbie Wasserman Schultz, a number of election-integrity experts found the certified results problematic. Lulu Friesdat, a journalist and documentary filmmaker who has investigated election issues for over a decade, worked with a team of data analysts, and they found statistical red flags in the results. Canova wanted to inspect the ballots, initially in about a dozen precincts, under Florida’s public records law. By inspecting the ballots, Canova, a Nova Southeastern University law professor, sought to verify the vote, which he hoped would put people’s concerns and suspicions to rest. In November of 2016, Friesdat filed two public records requests with the Broward County Supervisor of Elections Office. The office did not comply fully with the public records requests, and falsely stated that they “do not capture Ballot Image Files.” In March of 2017, Canova and Friesdat filed a third public records request with the office. In June of 2017, after the Broward Supervisor continued to stonewall the requests, Canova filed a lawsuit to gain access to the ballots. On September 1, 2017, while the lawsuit was pending, and prior to allowing any inspection, Brenda Snipes, the Broward Supervisor of Elections, personally signed off on the illegal destruction of all of the ballots and accompanying documentation in the race. Even after Snipes destroyed the ballots, she concealed the fact, until forced to disclose the illegal destruction during the discovery phase of our lawsuit. As the court suggested in its May 11, 2018 order granting Canova summary judgment, even after Snipes admitted to the destruction of ballots, she continued to act in bad faith by litigating for another eight months, thereby harming Broward County taxpayers by needlessly driving up the litigation costs for both sides. Without the original paper ballots, and using only digital scanned images, elections experts that were consulted say it is impossible to verify the results of our primary against Wasserman Schultz. There are an unfortunately large number of ways that the process could produce an incorrect ballot count. Ballots could have been lost or replaced before the scanning; ballot on demand machines could have produced extra ballots; some digital images could have been either accidentally or deliberately repeated numerous times. Digital images themselves can be altered, and there is no convincing chain-of-custody evidence for these digital images. The process of creating them involved using third-party proprietary software, as well as assistance from a third-party vendor, Clear Ballot. Even the chain-of-custody documents for the original paper ballots were not filled out fully. When Ms. Friesdat’s data team was able to review some of the information from the election, they found large and unexplained discrepancies between the number of voters who voted and the number of cast ballots. In all, there were more than 1,000 discrepancies, and out of 211 precincts only 19 had the same number of voters and ballots. These irregularities were highly concerning to election experts. According to U.S. intelligence agencies, there are serious risks to the integrity of our elections from hacking or other electronic manipulation. Those risks could be from either foreign or domestic sources. The ease of hacking into electronic voting machines – even those not ordinarily connected to the internet – was recently reported in a New York Times Magazine article by Kim Zetter entitled “The Myth of the Hacker-Proof Voting Machine” (Feb. 21, 2018). It is incumbent on us all to protect our democracy, and to make sure that we fully verify the accuracy of our elections.